Steve Vincent has been presented with a Lifetime Achievement Award for his services to tennis at the St Helens Sports Awards. Steve, who has retired from his role as Director of Tennis at Rainford Tennis Club, was presented with the award by St Helens Council at the Town Hall following over 10 years of dedication to increasing participation in tennis and other sports. 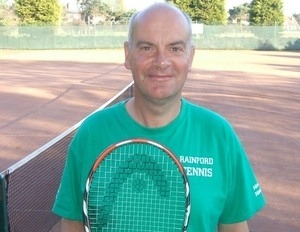 Steve took over the leading role at Rainford Tennis Club in 2005 and since then he has introduced an entire generation of children to the sport of tennis. He was delivered weekly coaching sessions at both Rainford Tennis Club and the Spinney Park and also in schools across the St Helens area. Steve has given many hours of his own time freely to the development of Rainford Tennis Club and played a vital role in the facility project, which saw three new courts built at the Jubilee Recreation Ground in 2013. He has also dedicated many hours to establishing the Rainford Runners fitness sessions, which see weekly participation in running, cycling and walking in Rainford. Over the past 10 years, Steve has introduced thousands of children to tennis through the St Helens Schools Tennis programme, which has involved curriculum delivery, tennis competitions, teacher training and leaders awards. Steve has also supported the growth of the coaching team at Rainford Tennis Club ensuring the necessary people are in place to deliver the many coaching sessions and competitions throughout the year. All of this success was also recognised at the Rainford Tennis Presentation Evening when Steve received a special award from the members and players who have been involved in the programme over the past decade. The award was presented by Head Coach, Samuel Jalloh, who will now be responsible for the coaching programme going forwards. Steve, who will continue to be involved at Rainford as a Coach and Club Welfare Officer, will now represent St Helens in the Merseyside Sports Awards.